Mission Statement: "The general purpose of the club shall be to promote interest in sports cars and similar vehicles; to promote safe and skillful driving by conducting different types of regional events; to encourage participation in divisional/national SCCA events; and to promote safe and skillful operation of automobiles on the public highways through information/education activities for members and the community." 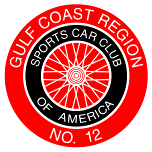 © 2019 Gulf Coast Region SCCA. All rights reserved.